Here is another photo I took two weeks ago or so. I think the photo is good enough to upload it but overall I am not satisfied with the quality. The squirrel was too far away and I had to crop the photo to get closer to the squirrel. Cropping does often work very well but I think the image in this post is a little too noisy. I tried to reduce noise with Lightroom but then it looked too blurred. However, it’s not too bad, you can at least see the squirrel very well. Oh, she is so cute, adore squirrels! Yep, you are right, I spent a lot of time with them until I could make some nice pictures of them! But it’s worth of it! I like that shot. Ever so cute! Squirrels seem to be very popular with blogs I’m following right now but I think those photographers live in more rural areas and have been bribing their squirrels with nuts. 🙂 This one has a lovely coloured coat and even if you were not quite satisfied it is not a bad picture. We have quite a lot of parks in our city, you find them mostly in the parks… I don’t think it has to be a rural area. 🙂 Lübeck is quite busy but the parks are quite which is why the squirrels like these small places of nature. I think too that the picture is not bad, I often look too much at the technical aspects… it was just a little bit more noisy and it was hard to find a nice colour balance and I dislike the bright highlights of the heaven. But sure, overall it’s not a bad photo. Hi Dennis, I don’t know if you have seen “Shedding Light” a blog I follow but she has great squirrel photos too. Never stumbled over the blog but I like suggestions 🙂 I checked a few posts out and she has lovely photos there. The squirrels look different but very cute. Subscribed for more inspiration and to kill future boredom 🙂 Also good to see some more cat photos. Thanks for the suggestion! I thought you would like her blog and I was curious if the European and North American squirrels are different. That is a beautiful squirrel! They do look quite different than the ones we have here. I love the ear tufts! I think with the squirrel’s bright color, it stands out quite well from all the tree branches. It’s adorable! I look forward to seeing more of your animal photos. 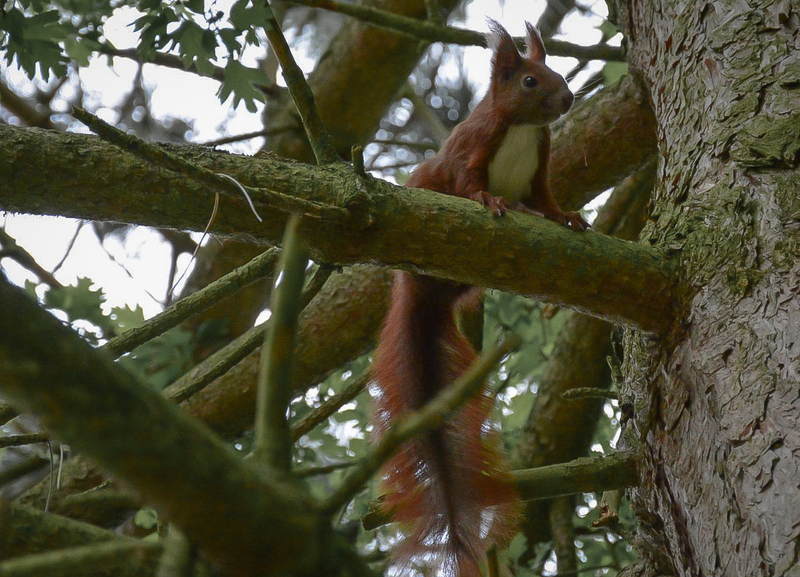 As the ones you took pictures of 🙂 It’s amazing how different they are but how beautiful both kind of squirrels are 🙂 Yes the ear tufts look pretty funny! Be prepared, my blog is pretty broad and I do even write about computer games and what not, but I do post quite a lot of animal related posts which means some posts could be interesting for you 🙂 I followed you too to stay tuned, I find it inspiring to see photos that others take, not only that, as we noticed it’s also interesting to see the differences of the animals for example 🙂 Keep up the good work!